What’s in these decadent, gold-dusted Double Chocolate Protein Balls? Chocolate, more chocolate, and a dose of good luck. Oh, and some other really good stuff like almond butter (to make them even more delicious – of course), and honey and dates (to add natural sweetness). Plus, these Double Chocolate Protein Balls have another ingredient that makes them stand out from the crowd. Like our Flourless Brownie Muffins, they have a secret ingredient that adds fiber and protein without changing the flavor of the chocolatey treat: Beans! Trust us, you won’t notice they’re in there. Watch how Autumn makes them in just a few minutes in a food processor, then adds a fancy finishing touch with a light dusting of edible gold dust. You can find edible gold at specialty grocers, online, and anywhere cake decorating supplies are sold. It’s worth the effort if you want to bring a dazzling dessert to a potluck, but you can skip this step if all you need is a healthy chocolate fix. 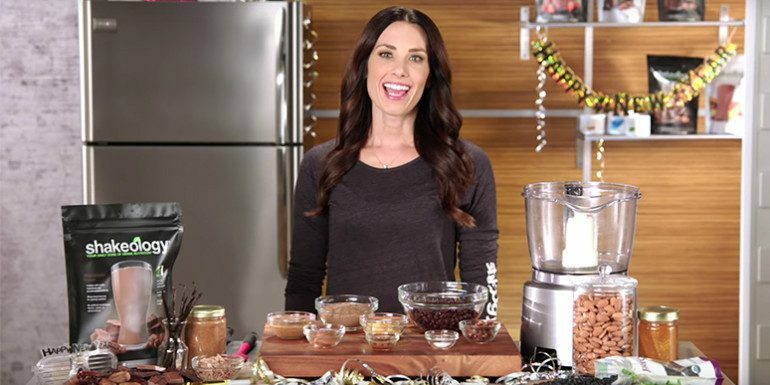 Autumn Calabrese made these chocolate Shakeology treats to ring in the new year with extra good luck. In many cultures beans signify prosperity, and gold may be one of the most universal symbols of prosperity there is! Tip: Get your hands wet before you form the mixture into balls to get a better shape and to keep them from sticking to your fingers. Place dates and black beans in food processor; pulse for 1 minute. Add almond butter, honey, Shakeology, cocoa powder, extract, and salt. Pulse until well blended. Roll into twelve balls, about 1-inch in diameter each. Sprinkle (or paint) balls with gold dust right before serving, if desired.